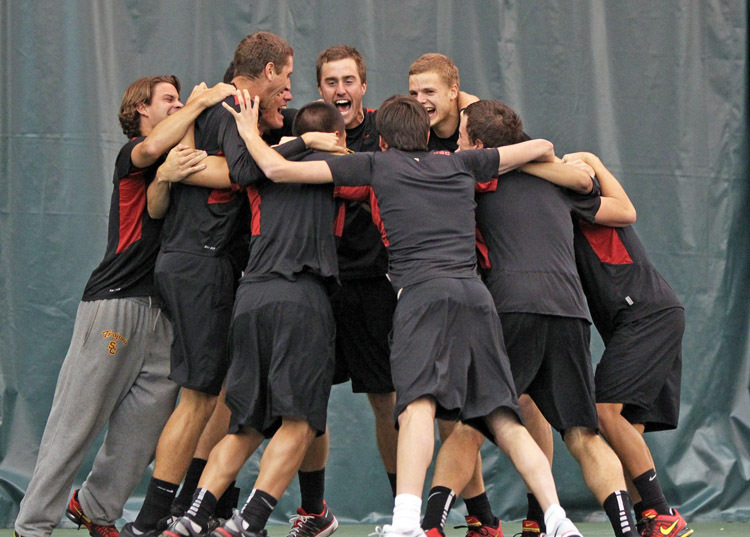 The reigning three time NCAA champion Southern California Trojans picked made it three at the ITA Men's Indoors too, as they defeated the Ohio State Buckeyes in a match that went down to the last court. The finals started with USC losing the doubles point for the first time in the season, but they rebounded in singles to hold a lead at 3-2. The Buckeyes tied it up and it all came down to No. 5. It was there -- in the third set -- that Trojan Yannick Hanfmann capitalized on one break to take the set and the match for his team at 4-3. It was the very first ITA Women's Indoors title for the UCLA Bruins. The women took the trophy with a 4-0 win over Duke, but it wasn't quite as easy as that sounds. The Bruin women had two other opportunities to win this title (1990 and 1995) and fell short. This year they started out with a very tight doubles point and then followed through with three singles matches. Though it was a sweep, the matches -- especially those left on court -- were all very close.